Emily Setlack powered to an impressive 11th place finish in the World Mountain Running Championships to lead the Canadian senior women's team to a 9th place finish. Emily's finish just outside the top 10 is the second best performance of a Canadian at a World Mountain Running Championship/Trophy and the best since Valerie Chowaniec's 9th place finish in 2001. Team Canada had top performances from both their veterans and rookies as Emma Cook-Clarke (36th) and Adele Blaise-Sohnius (47th) helped secure the Canadian team their top 10 finish. Emma is a relative newcomer to the sport and is only in her first full season as a mountain runner. Adele, on the other hand, is competing in her fourth straight World Mountain Running Championships for Canada. Colleen Wilson (63rd) struggled with altitude early in the race and will have to wait until her next race to match her 3rd place performance in the 2017 NACAC Mountain Running Championships. 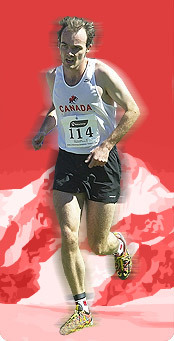 Kris Swanson (55th) used his mountain running experience to lead the Canadian senior men's team to a 17th place finish. Matt Setlack (58th) finished mere seconds behind Kris and the two ran the final hill in sight of each other. Gareth Hadfield (76th) improved six spots from his finish in the 2017 Championships and rounded out the scoring for the Canadian team. Canadian Champion Karl Augsten (87th) did not have his best day, but finished well within the top 100. Nicolas Courtois (61st) was the top Canadian junior man in his first international running competition. Olivier Garneau (64th) was also running for Canada for the first time, but struggled with a cold on race day. Melina Stokes (55th) did an excellent job representing the Canadian junior women's team. Photos from the event are available on the Canadian Mountain Running team's Facebook, Instagram and Twitter pages. Tomorrow the Canadian mountain running team will compete in Canillo, Andorra at the World Mountain Running Championships. The race course climbs from the town of Canillo to the top of a ski hill directly above the town of Canillo. The top of the mountain is over 2400m high. This year's Canadian team is a mix of a mountain running veterans and newcomers to the sport. Canadian Mountain Running Champion, Emily Setleck, will be competing at her first World Mountain Running Championships. She has a wealth of experience in international competitions for Canada and has won the Canadian Mountain Running Championships twice. Emily's teammates are Emma Cook-Clarke, Colleen Wilson and Adele Blaise-Sohnius. Emma finished in the top-10 in the NACAC Mountain Running Championships in New Hampshire, USA in July. Emma and Colleen have previously been teammates while representing Canadian at the FISU cross-country championships in 2016. Adele is an uphill running specialist and was the top Canadian at the World Mountain Running Championships in 2016 in Bulgaria. On the men's side, Canadian Champion, Karl Augsten, is competing is his first World Mountain Running Championships. Karl is living in Canmore, Alberta and has spent much of the summer running up mountains in the Rockies. Karl's teammates are Gareth Hadfield, Matt Setlack and Kris Swanson. Gareth and Matt were teammates at last year's World Mountain Running Championships in Premana, Italy. Gareth finished second at the 2017 Canadian Track and Field Championships in the 3000m steeplechase. Matt was the top Canadian at the World Mountain Running Championships last year. Kris is the most experienced member of the Canadian team, having competed for the Canadian team in mountain running every year since 2008. He was a medallist at the Commonwealth Mountain Running Championships and has a best Worlds finish of 30th in Slovenia in 2010. In the junior men's race, Nicholas Courtois and Olivier Garneau, both from Quebec, will be competing at their first World Mountain Running Championships. In the junior women's race, Melina Stokes, from North Vancouver, will also be representing Canada for the first time. Results will be posted online directly after the race. It was announced today that next year's World Mountain Running Championships will be held on November 15 and 16th, 2019 in Patagonia, Argentina.